Structural Levels............, we already have encountered them on many occasions. What precisely are they? "Right after the Two-Part Invention, I wrote that a central issue of this book would be : 'Do words and thoughts follow formal rules?' One major thrust of the book has been to point out the many-leveledness of the mind / brain, and I have tried to show why the ultimate answer to the question is, 'Yes – provided that you go down to the lowest level – the hardware – to find the rules'." "When we humans think, we certainly do change our own mental rules, and we change the rules that change the rules, and on and on -- but these are, so to speak, 'software rules'. However, the rules at bottom do not change. Neurons run in the same simple way the whole time. You can't 'think' your neurons into running some nonneural way, although you can make your mind change style or subject of thought." Within the mind / brain events several layers (levels) can be distinguished, which together form a coherent whole. But with it there always exists -- and this does not exclusively apply to mind / brain -- one level -- the lowest -- which is inviolable, for although the higher levels can -- namely through feedback loops -- influence each other in both ways, i.e. to and fro, we can always observe a level which exerts its infuence 'upwards', but which itself cannot be influenced by any higher level. A game of chess in which in virtue of the moves also the rules change. 1. THE GAME OF CHESS has rules governing the possible (i.e. allowable) moves of chess pieces. Now we could additionally set some extra rules that determine how to change the original rules. In this way we could for example agree that certain moves directly change certain rules in order to govern subsequent moves. These 'meta-rules' can be defined on a second chess board. So now we have two levels of rules : Rules which determine the allowable moves, and rules which determine how the rules are changed, rules and meta-rules. And now it is possible to agree again on rules which determine how to change the meta-rules. And so we can go on. But, we will always find a level which itself is not influenced : In this case the highest -- however we could better say : lowest -- 'metalevel', namely the last meta......meta rules that we have set up. This level is inviolable, because by definition we do not have at our disposal rules which determine how to influence it (the sequence of these metarules must stop somewhere for the game to be completely defined). There is even a lower level which is inviolable too. That is the level of the implicit agreements between the chess players, for instance that each in turn can move a piece, and moreover, only one piece at a time (except in castling). Figure 1. The Author Triangle. Yes, if the three authors themselves figure in a novel of H.
A, B and C can influence each other directly or indirectly. Directly : A can attribute to B weird properties, therefore B then can attribute weird properties to C, and therefore C can attribute weird properties to A. A can attribute weird properties to C, via B. B can attribute weird properties to A, via C.
C can attribute weird properties to B, via A. A, B and C form three levels which are however not hierarchical because they can mutually influence each other. Together they constitute, what HOFSTADTER calls, a Strange Loop, a Tangled Hierarchy. The author H however stands outside this Tangled Hierarchy. He has made up this Author Triangle in its entirety. The author H can influence the authors A, B and C, but they cannot influence him. They even don't know about him, despite the fact that they are supported by him. The author H represents the inviolable level on which rests the tangled hierarchy of the levels A, B and C.
In this print we see two hands drawing each other (Figure 2). Together they form a Strange Loop, or Tangled Hierarchy of the drawing and the drawn. They influence each other mutually, by the feedback relation. They can change each other. 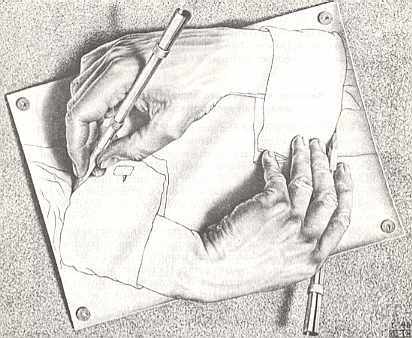 But they cannot change the undrawn hand of Escher, which created both hands in the first place. Escher's hand is the inviolable level, carrying the tangled hierarchy. ---- I think that in this way we get a clear image of substrate categories. These are lowest levels which support higher levels. They are relatively rigid but support a possible flexibility of the higher levels. If this inviolable level is omitted from consideration -- for instance because some structures create the delusion of non-existence of an inviolable level -- it appears that many phenomena do not have a natural cause. The decribed levels are most strongly expressed in complex situations, where, as coming out of the blue, phenomena become visible which originate from, but are not present in, one or other inviolable lowest level with respect to those phenomena. If we consider two individual human beings, say, Socrates and Plato, then we see that they appear to differ in every respect, in all their anatomical details, their genetic make-up, and also their character. Where then is the substantial form, or, as one wishes, the forma totius ( = non-designated matter + substantial form), namely MAN, or HUMANITY, which is supposed to be identical, with respect to content, in both? Well, we could identify this 'form' with the HIGHEST LEVEL in both. This seems to be identical in both (identical with respect to content). Their lower inviolable level -- their biological constitution -- is different in both. This level could -- as was noted earlier -- be called the 'Syntactic Level'. It is a level in which deterministic interactions take place, or, as we could express ourselves, in which deterministic manipulations of discrete units take place, on the basis of certain rules. The highest level in which Socrates and Plato are specifically identical to each other, could perhaps be called the 'Semantic Level'. It embodies the MEANING of both 'objects'. And this meaning is (specifically) identical in both, i.e. exactly identical. The syntactic level is -- that is certain -- wholly located within the object, and is as such objective. But the semantic level -- which embodies the meaning MAN, or HUMANITY -- seems not to be wholly located within the object. It is -- so it seems -- partly localized in a contemplating cognitive structure. Hence the semantic level is not completely supported by the syntactic level, but is partly supported by a contemplator. Such a view in a sense approaches a nominalistic position. Especially in complex things, like for instance higher organisms, it is conspicuous that among their properties there are some, we call them emergent properties, that are in no way as such (again) found in the constituents of the thing, also not as a summation result, like for instance the blue of the sky, which indeed is just a summation result, i.e. the contributions of the individual air particles (with respect to their interaction with light) add to each other, resulting in a summation resultant. Such emergent properties, also called totality-resultants, thus appear as it were suddenly, and unexpected. Nevertheless they cannot pop up from nothing. They must be the result of interaction between the parts, in which effects, as they change constantly, 'bubble up' from 'beneath", in such a way that their origin is not directly detectable (i.e. recognizable) anymore -- hence also not as an ordinary summation resultant -- from the constituents. They appear to be something quite new. All this suggests -- because of the "(bubble) up from beneath" -- a stacking of two or more structural levels. Thus with that, it is possible to contemplate such a complex thing, departing from those different structural levels. With it Natural Science tends to ascend from the lower levels to the higher levels (in a consideration afterwards) because of the explicative value of these lower levels, while Metaphysics, as could turn out, starts its consideration from the higher levels. Natural Science goes from the lower level to the higher level in the context of an explanation. In its investigation Natural Science descends from the higher level (to be explained) down to the lower level, and there it tries to find the causes of the phenomena present at a high level (high-level phenomena). This approach implies that some of these phenomena, for example color, end up in something quite different from color, for instance wavelength. In general, Natural Science ends up with entities which are as such mysterious in an everyday context. So the quantum mechanical explanation of properties (chemical and physical) of the smallest particles of a chemical element leads to the modern concept of the atom. But such an atom is totally mysterious. What precisely is taking place inside an atom cannot be described with classical concepts anymore, but only by means of a mathematical formalism. In this way the electrons of an atom are surely not particles revolving around a nucleus, but must be described as something like 'standing waves'. In a classical context a particle -- an electron nevertheless often behaves like a particle -- cannot be described as a wave. In Metaphysics Totalities-as-such are considered, i.e. it considers individuals (full-fledged individual beings) insofar as they are individuals. Whatever whatnesses the constituents possessed, the Totality has its own fresh whatness. The Totality is not anatomized into physical elements by Metaphysics. The Totality has its own principles because it IS no longer its elements. In such a totality-contemplation, a contemplation at a high level -- the metaphysical contemplation -- the Totality itself is fundamental, in which the elements are directed to this Totality, and in this way dependent on this Totality. Hence in fact the elements do not play a role anymore in such a consideration -- they are only 'virtually' present. The constituents -- the elements -- have as it were become extrinsic, they were present before the formation of the Totality, now they are not there anymore, because now only the Totality is (present). The proper principles of the Totality are Matter and Form, in which "matter" in the expression "Matter and Form" is formed matter. This Matter IS as it were the Form of the Totality, because the matter is the subject. Here this means : the reference (point) for an attribution. The Form is the whatness of the Totality, not the whatness of the elements. Seen physically, it is the effect of the interactions of the elements (the parts of the Totality concerned). Seen metaphysically it is (one of) the intrinsic cause(s) of the Totality (i.e. of the individual Substance). 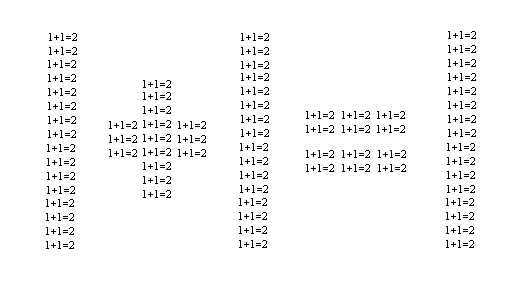 It (i.e. the Form) is that something which determines (with respect to content) the Totality to be that what it is, and what it remains under changes of state. All this does not in any way apply to aggregates. An aggregate IS intrinsically its constituents. Extrinsically though, it can be ONE entity. It can be named (as such) from without, like for instance a "house", or a "granite pebble". But such an aggregate is itself not a house, not a granite pebble, but IS, a has been said, its elements. Like a Totality, an aggregate can, while remaining the same, find itself in different states. But in fact the aggregate does not possess a self. That (something) which remains the same under different states are the elements which compose the aggregate. Only they enjoy, each for themselves, a self(-being). The elements of the aggregate together do not form a definite pattern in virtue of themselves, they are much too 'individualistic' for that, they haven't yet lost their self-being by subjecting themselves to some Whole. These elements themselves represent the highest intrinsic level of the aggregate. So in fact an aggregate does not have any differentiation of levels. If there is a higher level, then this will be extrinsic. The physical constituents of a Totality -- a Whole -- are accordingly, when viewed from the highest level ( NOTE 1 ), only virtually present in that Whole, as is (also) asserted by (classical) Metaphysics, while they are actually present in that Whole if we view the latter from lower levels, thus in the context of an actual scientific analysis, i.e. in actually anatomizing that Whole into its physical parts, or, if we view that Whole in the context of an analytical description (i.e. conceptually anatomizing that Whole). This low-level approach, leading to the constituents actually being present, is the one that is typical in Natural Science ( NOTE 2 ). Figure 3. Two structural levels. The lower level is 'rational' (1+1=2), while the higher level is 'irrational' (1+1=1). ---- So a human being is always rational seen at the level of his brain cells (neurons), i.e. these braincells and their mutual wiring constitute a physical device that works according to strict electrochemical laws, and in this sense it works 'rationally', while at a much higher level that same human being can sometimes think irrationally. Another example of a discrepancy between levels is the fact that a room which is gradually being filled with a perfume evaporating from a liquid, is, as seen at a high level, time asymmetric, while at the molecular level it is time symmetric. Time asymmetry is a holistic concept and cannot be reduced to the properties of individual molecules (See DAVIES, P. 1983, God and the New Physics, Chapter 9). These structural levels could perhaps be interpreted as a hierarchy of several substantial forms in one thing ( NOTE 3 ). And this possibility is (as impossibility) discussed in, among others, the sixth Chaper of De Natura Materiae et Dimensionibus Interminatis (A treatise, initially ascribed to St Thomas) which could be thematically studied with respect to such levels. The substantial form could however also be taken as directly connected with the one highest intrinsic level in the stack of the many structural levels in a thing, resulting in only one substantial form in each Substance. This we have already suggested on several occasions. One of the reasons was that, especially in the very Substances, namely the higher organisms, no two individuals are specifically identical. Only at the highest structural level the individuals of a species are identical, and that level would correspond to the whatness of the thing, and be directly related to the Substance by representing its Essence. In this way the 'one substantial form" (in each thing) would have been 'saved'. The highest structural level manifests itself in 'emergent phenomena'. These are phenomena which as such are not visible at lower levels. However these phenomena are effects of many local interactions at a lower level. Hence as such, an emergent phenomenon (for example "to think (rationally)", which serves as the basis for the characterization of the Essence of those beings which we call "human beings"), or a collection of such emergent phenomena, cannot be identified with a substantial form, because such a form is supposed to be a cause, not an effect. But also the cause of those emergent phenomena cannot be identified with the substantial form, because that cause consists, as has been said, of the local interactions at a low level, which are interactions between genuine physical parts of the thing, resulting in the thing being dissolved into several Substances. But then we have destroyed that thing-as-one-Substance, or, in other words, we end up with a contradiction. Moreover, as has been said, the individuals of a species are all, seen at this lower level, specifically different from each other (at least in the case of higher organisms, including man), and consequently at this lower level we cannot find something which is specifically identical in all relevant individuals, i.e. something which is precisely repeated. So also in this way we do not find the substantial form. Where we do find identical aspects they are of a very general nature, i.e. they are not only present in all the individuals of that particular species, but in many other species as well. For instance certain atomic types, say Carbon, are present in all organic beings and beyond. We have found also that to-be-a-Totality (and with it, to-be-a-Substance) is gradual. There exist different gradations of being a Totality. If we assume only one substantial form in each Substance, then it becomes difficult to imagine Substances which are lesser-degree Totalities, unless we let the substantial form account for this, but this looks a little like putting the horse behind the cart. A plausible explanation for the existence of several gradations of being-a-Totality can be the (corresponding) graduality of the strength of the interactions at that lower level, in virtue of which the parts are more or less strongly held together, and in this way form higher- or lower-degree Totalities. Are the (interacting) parts of the thing the true Substances? And do these parts in turn consist of interacting parts, in virtue of which those latter parts are the true Substances? Are there consequently only genuine Substances (to be found) at one or another lowest level, the ultimate, inviolable level, and not at any higher level? Earlier I have stated that the cause of high-level phenomena must be sought in the relevant interactions at a lower level. This complies with the view of modern Natural Science. Nevertheless sometimes doubts are cast on this view, also by practitioners of that Science. So for example by SHELDRAKE, in his well-known theory of morphogenetic fields. Proteins are long chain-molecules which curl up and fold into complex forms. Each protein species (i.e. each individual of such a species) folds itself in a specific way, and in the same (specific) way on every occasion, resulting in a typical (with repect to that species) three-dimensional form (the form of the individual protein molecules). Precisely by having this particular form such a protein can execute its determined function within an organism. The folding of such a molecule is a complicated process and could easily go wrong. Nevertheless it always happens flawlessly. This is explained by assuming that the form in question, resulting from the folding process, contains a minimum of energy, in virtue of which precisely that particular form is the most stable energetically, amongst a very large number of alternative ways of folding, with other resulting forms, but with higher energies. In order to visualize all this, suppose we have a marble in a bowl. If one applies a knock to such a marble it will climb the wall of the bowl, but eventually return to the bottom where it has the lowest (potential) energy. It is a stable system. On the other hand a marble on top of a bowl which is turned upside down embodies an unstable system with high potential energy. When a small disturbance is applied to the marble it will roll downwards transforming its potential energy into kinetic energy, and this latter will finally be dissipated in virtue of friction and impact on the ground. Now the marble finds itself in an energy minimum, and embodies a stable system. But, returning to proteins again, it seems to turn out that within the total arsenal of, with respect to any particular protein, geometrically possible forms, there are many such forms with the same energy, or with only slightly different energies. Having in mind this, it is unexplainable that a certain particular (species of) protein always folds itself in the same way (after it was unrolled in the laboratory). The minimum energy state of a protein molecule is dependent on the particular chemical composition of such a molecule, and this means, in the case of proteins, the particular set of aminoacids and their sequence. Hence this chemical composition evidently does not embody all the information necessary for the particular way of folding which always takes place, all the more because of the fact that there are proteins which are very similar in their three-dimensional form, in virtue of an almost identical way of folding, but which differ strongly in their chemical constitution. On the basis of all this, but also of many other phenomena, SHELDRAKE accordingly assumes that besides the condition of minimum energy there must be something else which governs the protein in its folding. But what is that "something else"? According to SHELDRAKE it is an immanent field under which (influence) the folding protein is going to find itself, a so called Morphogenetic Field (See SHELDRAKE, R., 1981, A new science of life, and also SHELDRAKE, R., 1988, The present of the past). Expressed differently, such a folding protein tunes in to a definite 'chreode' (an abstract 'furrow' as we could call it) which leads the folding process to a definite end state. This tuning is related to the vibrational nature of the molecule and the field. Such a field is accordingly interpreted by him as formal cause (structural cause). It is clear that in this way we come close to something like a substantial form (because the field is immanent). Hence an emergent phenomenon would then perhaps not completely be reducible to lower levels. These lower levels could be just the material cause of it, while the morphogenetic field would represent the formal cause. In In VII Met. lectio 17, nr. 1672--1680 St Thomas, following Aristotle, considers the character of (being) a Totality in order to figure out in what way Substance is cause and principle. A true Totality IS not its elements. The elements constitute the matter. A Totality still contains something beyond its elements. What would that be? This 'something beyond' could itself be either again an element, or consisting of elements. Both possibilities lead to an infinite regress. In nr. 1678 he proposes that this "something beyond" is the "Substance" of the thing, however, only in those things that are indeed true Substances. This "Substance" or "nature" is not an element, but a formal principle. Here the Commentary on Book VII of the Metaphysics of Aristotle ends. It ended up with an assessment of Substance (what Substance is, and where we can find it), an assessment, not along the 'via praedicationis' (i.e. through research into the way of predication), but along the 'via physicorum', i.e. through a causal consideration and one with respect to the nature of being-a-Totality. We could also say, along strict metaphysical lines (in contrast to logical lines). Whatness is not the same as the Elements. Hence a summation of the elements of which a Whole is composed does not -- according to the text -- give us the whatness of this Whole, it only gives us its material cause. This we could call its low-level whatness. The true whatness, i.e. the Substance, then is the whatness of the Whole at a high level. So the text already gives a hint for recognizing a distinction between levels. Substance is the individual thing minus designated matter (materia signata), and minus the Accidents. Essence accordingly is : forma totius. The intrinsic causes of Essence are : matter, and form. So the form is the formal cause of the Essence, and as such the form is the whatness of the Substance concerned. Matter is a component of the Essence of sensible things, because matter is essential for sensible things, as sensible. A specific distinction, i.e. a distinction with respect to content, between sensible things and non-sensible things is grounded in their respective forms, not in their matter. Matter takes care of the ontological distinction between sensible and non-sensible things. So the form is the whatness and as such it is the whatness of the thing at a high level (i.e. as it is at a high structural level of the thing). In virtue of matter the sensible thing has the ability to change, because it then is catallel (i.e. it is ontologically composed of two 'parts', alleles), and its matter could be informed by another form (which replaces the original form). In this way the matter is a fixed point of reference with respect to which forms can be replaced by other forms, and this is a change, i.e. a change of the thing. The matter of sensible things does not partake in the whatness of the thing at a high level, but is the whatness of the thing at a low level. If the high-level whatness is not specifically dependent on the low-level whatness, i.e. on the qualities of the elements, thus if this high-level whatness -- the form -- just needs (in order to exist) one or another apropriate material substrate, thus not a specific substrate, then this high-level whatness is medium-independent : Such a high-level whatness could exist in several diverse appropriate substrates. This appropriate substrate is not Prime Matter, but consists of the elements of which the Whole is composed. Prime matter is just a principle of the possibility of radical change (See the Essay on Medium-independency for further implications). It is however still to be investigated to what extent the high-level whatness partakes in the elements. With respect to content it cannot be completely separate from them. But it could nevertheless be the case that a whatness A partakes in elements b and c, but that such a whatness A can also result from the elements d and e, however definitely not from whatever elements, i.e. not from just any element whatsoever. So the whatness of these elements does play a role, but perhaps not a specific one, but a generic one. The whatness of the elements -- in the proposed view -- does not, just like that, enter the high-level whatness of the thing : The whatnesses of the elements are appropriate to be exchanged for the whatness of the Whole, when we ascend from the lower level to the highest level (See for such a rise from lower to higher level the "Fuga Formicalis" (Ant-fugue) of HOFSTADTER, D., 1979, in his famous book Gödel, Escher, Bach). Insofar as we recover the whatness of the elements in the Whole, they are the whatness, not (anymore) of the elements, but of the Whole, because the elements are only virtually present in the Whole. We see this theme continually recurring. The solution of the problem of the generation of an own specific whatness, and (even) an own Identity, in the sense of self-being, out of entities which are, each for themselves, with respect to content different from the mentioned whatness of the Whole, directly implies our orientation with respect to the interpretation of Substance, and especially of the substantial form (namely whether the whatness is perhaps already implicitly present in the elements, and how it finally becomes explicit in the generation of the Whole). The distinction, within a being, of structural levels offers, it is true, a number of clues for a solution of the problem concerned, but is not going to represent a final solution. The matter, presented in this way, is still too vague. We will see that the recent Theory of (Non-linear, Dissipative) Dynamical Systems, which is intensively studied in our days, can tell us more about just how such a Totality (intrinsic being) is actually generated from (more primitive) elements. In this respect it especially concerns the 'evolutionary' systems, which I earlier have called "process structures" (See the Essay Historical Individuum, Here-and-now Individuum, Section Process structures). In Chapter 2 (Leonina edition) line 84--163, of the De Ente et Essentia St Thomas discusses the integral parts of a Substance, and in what way these parts appear in the Definition. The further determination of the genus to one or another species is accomplished by the specific difference which is taken from the form (The form provides the intelligible content of the difference). The genus however contains implicitly (potentially) that something which is expressed in the possible differences. And this is why the genus can be predicated of the species. This also applies to a higher genus with respect to a lower genus which results from a further determination by a difference (in this case not a specific difference, but a generic one). So for instance the genus "body" with respect to the (lower) genus "animal" (which is given by St Thomas as an example). However, "body" can also be considered as part of an animal and as such it cannot (with "is") be predicated of "animal". Something similar applies to "animal" with respect to "man". How should we precisely evaluate the view (the alternative, not exclusive, possibility) that "body" (here not as a genus) is a part of "animal"? The conventional answer reads : An animal consists of its body and its (animal) soul (likewise in humans). What precisely is this 'soul'? The assumption of (the existence of) an immaterial 'part' turns the matter at hand into a formidable problem, and this is enough to be receptive to attempts to relate the whole animal with one type of origin. As long, however, a satisfying solution is not at hand, we should keep open both 'options'. The matter should have the form of an ongoing, but friendly discussion. Let me propose a possible solution about what the (animal) soul really is. According to me "animal soul" is a description of an animal at a high level, in contradistinction to, for example, a description of an animal on the basis of its chemical constitution, which is a decription at a low level. The low-level description is a reductionistic one, i.e. an analytical description, while the high-level description is a holistic one, i.e. a synthetic description. What exactly is it, in Reality, that corresponds to these descriptions? The low-level description doesn't exclude anything which could be indicated (in the animal), at least it pretends so. In this sense it is complete, and is used in Natural Science. The high-level description refers, according to me, to phenomena of the animal that, it is true, originate from those entities which are explicitly mentioned by the low-level description, but as such are not present in the low-level description. We already met them as 'emergent phenomena', which are he result of interaction and morphological and functional integration of demonstrable parts in and of the animal. "Sensitive soul" (animal soul) is such an emergent phenomenon. If such a phenomenon is continually present, and if it refers to the whole animal as such, then we can interpret this phenomenon as the high-level whatness of the animal, and thus as the (substantial) Form of the animal, i.e. as the Form of that thing which we indicate with the term "animal" (as first intention). Because this Form is the result of the integration of all the parts of the animal we can express this form by means of a difference, and such a difference can be predicated directly of a species, or of an individual : a dog is sensitive, and also Fido is sensitive. The intelligible content of "sensitive" is taken from the Form (i.e. the substantial Form). In this way the Form is not a material integral part of the animal (which indeed the heart is), and also not an immaterial integral part of the animal (something like an immaterial animal soul). An animal consists, it is true, of integral parts (for example its organs, extremities, etc. ), but not of body and (animal) soul. For parts are visible at one or another lower level, while the soul is not. This implies that the body isn't a part either. And so it must be the Whole. Again, the Form is (the result of) the integration of parts, it is not itdself a part. And "integration of parts" means the in-formation of matter. In Chapter 2 of De Ente et Essentia, line 150--163 St Thomas discusses "animal" (figuring as an example), which sometimes can be assessed as part, sometimes as genus. If "animal" only refers to a thing that can perceive, and that can move by itself, and if "animal" does not include in its meaning a possible further perfection (completion), then "animal" must be taken as part. If it does include, although implicitly, the possible further perfections, then "animal" is a genus. Of course it is clear that if we omit something from that what we call "animal" (and consequently do not include into the meaning of "animal"), then "animal" is just a part, but only because we take away something conceptually, namely the further perfections, while these further perfections are present in every actually existing animal. In Scholastic texts it is often suggested that the only further perfection (completion) of animal is : to be rational, i.e. the ability to think in a rational way, resulting in a rational animal, a human being. But, "animal" means sensitive organism, and this can be further determined (perfected, completed) in many ways. One of these ways is to be rational. For the other perfections we don't have existing names. The Apes and Man have common ancestors, who probably have looked quite similar (for us at least) to the recent Apes. That ancestral species has evolved further into two or more different directions : one branch leading to recent Man by acquiring rationality, one or more other branches in the direction of recent Apes by acquiring certain new qualities, which we do not know precisely, and for which we don't have a known general name (These qualities should be phylogenetically advanced -- "apomorphic" -- with respect to certain (homologous) qualities in Man, just like rationality in Man is phylogenetically advanced with respect to certain (homologous) qualities in Apes. In all this, by the term "advanced" is meant : derived). These new qualities are probably to be found in the way of life (behavior) of these Apes. However small the difference might have been between (1) the common ancestors of Man and recent Apes (or one of them) on the one hand, and (2) the recent Apes on the other, there will be a difference, because of the large time span involved, and because of being splitted from Man, and this difference, is the difference-as-expressed-by-the-(logical)-difference (figuring in the Definition), which is acquired by that part of the population (in a biological sense) of the common ancestral species, which has evolved into the recent Apes, or into one of them. Figure 4. Possible ancestral tree of Man and Apes. ---- In this scenario the ancestral species (5) has split a number of times, in which the last splitting resulted in the origin of Man ( NOTE 5 ) and his sister-species (one of the species of recent Apes). All of 1, 2, 3, 5, 6 and 7 probably have (had) a similar Ape-like appearance. Nevertheless there must be a difference between for instance 5, 6, 7 on the one hand, and 1, 2, 3 on the other, so also between 6 and 3, and the latter difference is accordingly a positive difference, added to 6. The addition in this case is perhaps small, although for us (humans) this is hard to judge. A second difference was added to 6 in another branch, leading to man. For diagnostic or logical purposes we can signify these differences with the terms "non-rational" and "rational". Figure 5. Another possible ancestral tree of Man and Apes. ---- Here the common ancestor of Man and the recent Apes has split into two branches. One branch gave the common ancestor of the recent Apes, the other branch gave Man. Also in this case the difference between 5 on the one hand, and 1, 2, 3 on the other, will have been small, but not absent. That Man would be more completed (more perfect) than, say, his sister-species (one of the recent Ape species) or sister-group (several or all recent Ape species) is partly subjective. In fact the Apes are just as 'perfected' (completed) as Man is. They also were differentiated from the common ancestor. So it is not correct to assume that the recent Apes, and likewise all other animals (in the strict sense), stagnated somehow after having reached a certain level of development, and that in Man something was added to "animal". Also in all other animals something was added (to "animal"), be it in each case something else, resulting in our having "animal-a", "animal-b", "animal-c", ..., "animal-q" and "animal-r" ( = animal rationale). In all these animalia we can distinguish higher and lower levels. In Man the high level is to-be-animal-rationale, in other animalia (i.e. in other subordinates of the genus animal ) it is something else. Because "animal" implicitly contains "rationale" (but also the above mentioned contrary difference), we can say : homo est animal (= man is an animal), but precisely because of this only implicitly containing "rationale" we cannot say : animal est rationale, and also not animal est homo, because animal can also be, say, gibbon ( = an Ape ). For a treatment of genus and difference the human example is not very instructive (which turned out in earlier expositions of mine) because there a philosophical prejudice is involved which could turn out to be wrong. I get the impression that the characterization of genus and difference is 'moulded' sometimes for the benefit of the characterization of man (and also of the characterization of living beings in general). So, for the interested reader, it would be useful and interesting to investigate the two mentioned logical intentions also with regard to more 'transparent' examples, like crystals (See, for an introduction into crystals the Essay Crystals and the Substance-Accident Metaphysics). "The difference is [...] like a denomination, taken from a determined form, excluding [in this denomination] determined matter as it is according to its first meaning, as is evident when one says animated [ = alive ], namely that which has a soul, without being determined what that [namely that determined matter ] is, either a body or something else. That's why Avicenna says that the genus is not understood to be included in the difference like a part of its essence, but only as a being outside that essence, like a subject too is related to the meaning of its accidents. And because of that also the genus is not predicated of the difference, strictly spoken, as the Philosopher says in the third Book of the Metaphysics and in the fourth Book of the Topica, except perhaps like the subject is predicated of an accident." So as long as we do not omit in the difference the determined matter (i.e. exclude it from the difference's reference), and, consequently, as long as we do not take that difference exclusively from the ultimate (in-)formation (= the last in-forming of the matter) -- in the words of St Thomas : from the determined form -- the difference obviously still contains that determined matter. Only when we omit it, the difference does not have this matter (anymore). And only then we can say that the soul is not the body. However it is questionable whether this 'determined form' does indeed not contain in its intelligible content the 'determined matter'. For if this form is the Substantial Form then with it we've got all what is formal, all the way down to Prime Matter. And also if we interpret this 'determined form' as the ultimate (in-)formation (i.e. the 'outer layer' of form), then this ultimate form nevertheless includes, i.e. implies, all the previous (in-)formations, because the latter are constitutive for this ultimate form. Such an ultimate (last) form corresponds to an emergent phenomenon resulting from all what is 'previous' (in the thing). Seen in this light we indeed can say that the soul is the body, as long as we view 'soul' as an emergent totality-resultant (i.e. resulting, not from a summation or addition of low-level entities, but from a totality), or simply as a Substantial Form. And this form is determined matter, indeed all determined matter ( = actualized, definite matter). This form, namely the soul, is the body-as-it-is-at-a-high-level, is Man-as-he-is-at-a-high-level. Only because we are so much used to the idea that body and mind are two composing parts of Man (and likewise of an animal : body and animal soul), we don't feel it to be appropriate to say "The soul (mind) is the body". See also In V Met., lectio 7, nr. 862, where, in a similar context, it is also asserted that "rational soul" cannot be predicated of "Man" (human being), because "rational soul" would refer to a part of Man. "But because, as has been said, the signification of the species with respect to the genus goes with the form, but the signification of the individual with respect to the species with matter, it should proceed in such a way that the word, which signifies that from which the nature of the genus is taken, signifies, to the exclusion of the determined form completing the species, the material part of the whole, like body being a material part of man. The word, on the other hand, which signifies that from which the nature of the species is taken, to the exclusion of matter-as-designated, signifies a formal part. And thus humanity is indicated as a certain form, and it is said that it is the form of the whole." With the last sentence St Thomas means that "humanity" signifies the forma totius, which is a composite of matter and form, but to the exclusion of matter-as-designated. As part of a Whole. (2) The individuation conditions (by which matter becomes designated). The Essence, here taken as forma totius, is accordingly the Essence considered to the exclusion of the individuation conditions (matter-as-designated), and because of that the Essence, so taken, can be considered as a part of the Whole. With respect to man : humanity. But if we -- and this is also possible -- consider the Essence, not to the exclusion of the individuation conditions, letting these conditions just implicitly (potentially) be included in that Essence, then that Essence indicates the Whole, and with respect to man this is : human being. That's why we can say "Socrates ( = the Whole) is a human being". We cannot say : "Socrates is humanity", and also not : "a human being is humanity" ( = "man is humanity" ), because, as has been said, "humanity" signifies a part of the Whole. And a part cannot directly be predicated of a Whole. The problem with all this is, according to me, the assertion by St Thomas that it is possible to exclude a form, and also to exclude matter-as-designated. Of course this can be done in thought (as a way of knowing and denomination), but does it correspond to a possibility of exclusion in the thing itself, i.e. can such an exclusion also take place in extramental reality (in a corresponding way), or, in other words, is there a real segmentation in extramental reality? According to Nominalism this is, as far as I have understood, not the case. The 'products' which result from such exclusions belong, according to Nominalism, to our way of knowing and denomination, and not, just like that, to the things themselves, at least this is not demonstrated by Thomism. materia signata = designated matter (i.e. individuation conditions). materia non designata = non-designated matter, i.e. matter, as not involved in the individuation conditions, but distinguishing material things from immaterial things. substantial form = the essential content of a thing. forma totius = non-designated matter + substantial form. materia prima = prime matter. This is the ultimate substrate of a thing, and as such a principle of the possibility of radical change. But these alleles, each for themselves, are principles (principles of changeability, actualization, individuation, knowability, specific determination, etc., in short, principles of Being), not parts (Also St Thomas has affirmed this somewhere). However in the Aristotelian metaphysics these principles are interpreted as concrete causes, residing in the thing. The thing is reduced to 'another thing', a thing in a stronger degree, the "very" thing, i.e. the thing proper, under the influence of the Platonic philosophy, abeit that that "thing proper" is not transcendent but immanent. This thing proper is prior (ontologically) to the 'ordinary individual observable (sensible) thing', in opposition to Nominalism of later centuries. With respect to this problem it would perhaps be instructive to interpret the matters at hand in terms of levels. The mentioned principles could then correspond with different levels in each thing. If these levels themselves were interpreted as just levels of description, then we approach the nominalistic view. If, on the other hand, we interpret these levels as structural levels, then we again move away from that nominalistic view. This can be seen in the mentioned Ant Fugue of HOFSTADTER, 1979, where an ant colony is compared with (or, more or less, isomorphously mapped onto) the human thinking mind. The lowest (for this decription relevant) level of the ant colony are the individual ants including their immediate interactions. With respect to the mind it consists of the individual neurons (brain cells) including their immediate (electrochemical) interactions. In the ant colony -- if the number of ants at certain locations exceeds a certain threshold -- temporary aggregations are being formed, consisting of ants which mutually co-operate (temporarily) : the 'squads'. These correspond qua function-within-the-Whole to, what HOFSTADTER calls, the "symbols" of the mind / brain activity : temporarily formed regions of co-operating neurons. In this way we have a second level. This stacking of levels continues until we arrive at the highest structural level : The ant colony, which acts as one whole ( NOTE 6 ), and the mind, which also acts as one whole. The higher level always includes the lower levels, it is an 'over-(in-)formation' upon 'previous' (in-)formations. But one can always indicate one or another inviolable relatively rigid lowest level. The emergent properties and behaviors, already often alluded to, 'bubble up' from the lower levels, and only become visible at higher levels. In this way we could perhaps interpret the principles of things (which cause something to be a thing, a Totality), especially of complex things. In virtue of these principles (in the things) it is possible for us to express something to the exclusion of something, or, not to such an exclusion, which is necessary for man's progression of knowledge about things. "Some people may think it is just common sense (or just good scientific thinking) to suppose you are nothing but a particular living, physical organism -- a moving mound of atoms -- but in fact this idea exhibits a lack of scientific imagination, not hardheaded sophistication. One doesn't have to believe in ghosts to believe in selves that have an identity that transcends any particular living body." (The Mind's I, p.6). "The brain consists of billions of neurons, buzzing away, oblivious of the overall plan (like the ants in the colony [...]). This is the physical, mechanical, world of electrochemical hardware. On the other hand we have thoughts, feelings, emotions, volitions and so on. This higher-level, holistic, mental world is equally oblivious of the brain cells. We can happily think while being totally unaware of any help from our neurons. But the fact that the lower level is ruled by logic need not contradict the fact that the upper mental level can be illogical and emotional. Hofstadter has given a vivid illustration of this neural-mental complementarity :"
"Say you are having a hard time making up your mind whether to order a cheeseburger or a pineappleburger. Does this imply that your neurons are also balking, having difficulty deciding whether or not to fire? Of course not. Your hamburger-confusion is a high-level state which fully depends on the efficient firing of thousands of neurons in very organized ways." (HOFSTADTER, Gödel, Escher, Bach, 1979, p. 577). "To use an analogy, a competently written novel will consist of a sequence of grammatical constructions conforming to rather precise logical rules of language and expression. Yet this does not prevent the characters in the novel from loving and laughing, or behaving in a completely unruly way. To claim that because the book is built out of logical word constructions obliges the story itself to comply with rigid logical principles would be absurd. It is to confuse two distinct levels of description." As already alluded to, the solution of the problem of locating the Essence (whatness) of a thing in terms of levels, especially structural levels, cannot be assessed as a definitive one, but is nevertheless an appropriate start, or stepping stone, leading to such a final solution. In the level approach the Essence turns out to be an effect instead of a cause (in the form of an intrinsic principle). By means of an approach in terms of dynamical systems we will find that Essence (namely the relevant dynamical law), which indeed is causal by nature (i.e. determining). The Dynamical Systems Approach is fully worked out in the Non-classical Series of Essays of this website.